In any busy household, breakfast can always be a bit manic, but this quick and easy breakfast is a great recipe to make for as many people as you need to feed. Served with some toasted sourdough bread, it makes for a healthier variation of the usual weekend fry. Preheat the oven to 180°C/gas mark 4. Grease six holes of a muffin tin with a little olive oil. Warm the teaspoon of olive oil in a large pan set over a medium heat. Lightly fry the garlic and spinach until the spinach wilts. If using rashers, slice them in half lengthways. 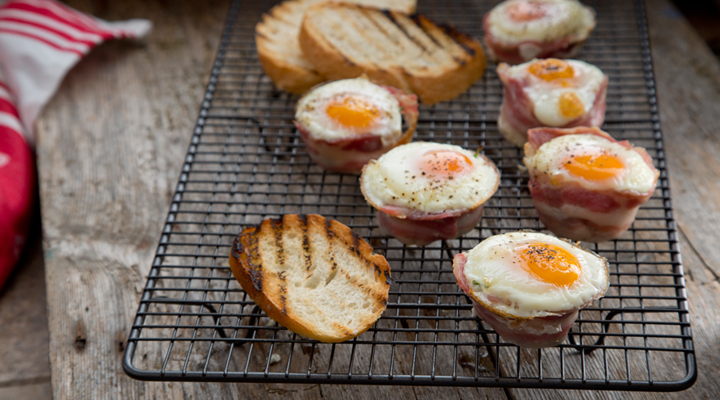 Wrap the bacon around the edges of each muffin cup, then add some of the wilted spinach. Finally, crack an egg into each hole and season with a pinch of salt and pepper. Bake in the oven for 10 minutes, until the eggs are set. Serve with some toasted sourdough bread. Tip: Try cooking with coconut oil instead of olive oil to add a different flavour. These muffins are high in vitamin D, which is essential for strong bones and teeth.